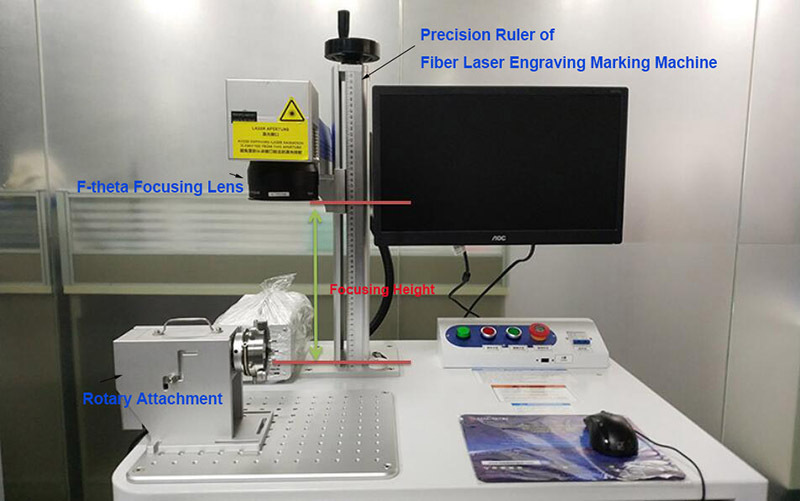 About the precision ruler of a fiber laser marking engraving machine, it is used to measure the precise focusing of the laser working on the surface of the material need to be processed. It is a very simple and unimpressive. 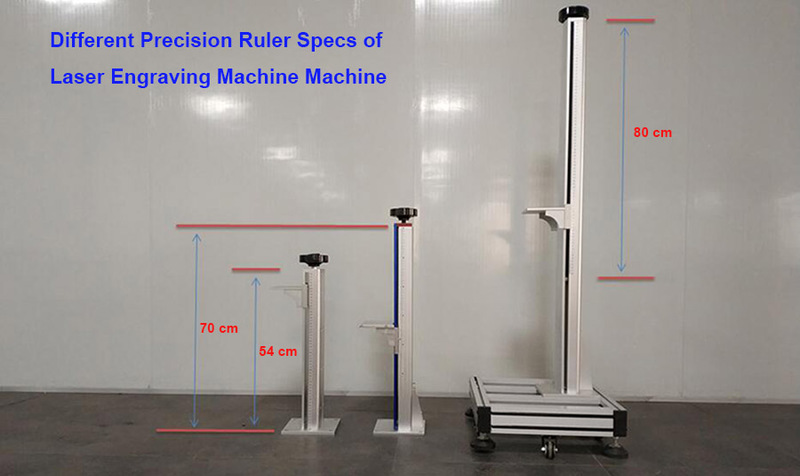 Actually, it is really not as important as some core components like optical galvo scanner & lens and fiber laser source. But in some especially situation and circumstance, it has a remarkable role. 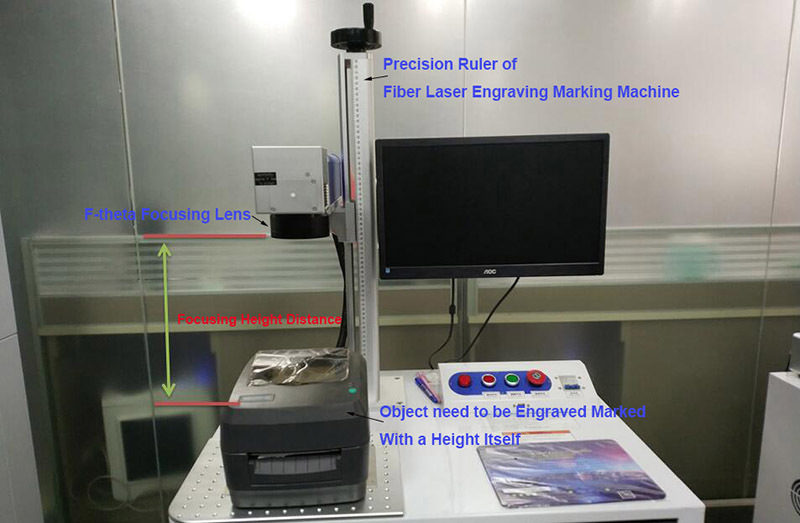 First, Let’s take a look at the common standard specification of the precision ruler of a fiber laser engraving marking machine. Normally, a 20W/30W fiber laser marking engraving machine’s precision ruler’s height is 54 cm. This height is high enough for the 110 x 110 mm, 175 x 175 mm, 200 x 200 mm f-theta lens’ focusing. Talking about a 50W fiber laser marking engraving machine, its f-theta lens usually is 200 x 200mm or 300 x 300mm, the wider area needs higher positioning for the lens and laser focusing. So the precision ruler equipped is better 70 cm. Of course, there is also an extra high precision ruler specification 80 cm. Then, what kind of precision ruler we should choose for our fiber laser engraving marking machine? Why there is an extra high precision ruler 80cm existing? The Answer is very simple, some object and material need to be laser engraved marked is big and has some height itself. Then this raises the focusing height. That’s why need a higher precision ruler in this situation. Here Below is a Vide of the Measuring and Testing the Accurate Focusing Height Distance from Lens to Object with a height. There is another factor, that sometimes we need to use a rotary attachment(or called rotary device), the rotary attachment itself also has some height, then it also raises the focusing height for the lens, and makes us need a higher precision ruler to ensure the laser focusing in a high position. Actually, there is another laser machine called flying online laser marking engraving machine. It is used to match with the modern auto or semi-auto production line for online/flying laser marking printing for bulk orders. This flying laser marking engraving machine’s precision ruler is usually equipped very high with 80 cm height. So that all about today’s discussion, more FAQ about the laser machine systems, welcome to visiting Mactron’s FAQ column. Thanks for your attention.